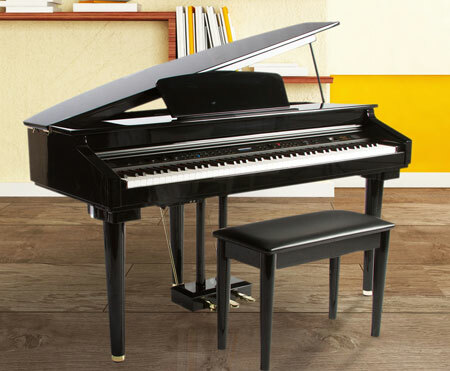 It features an exquisite polished ebony cabinet, expressive instrument voices, professional accompaniment tracks and a powerful sound delivery system. 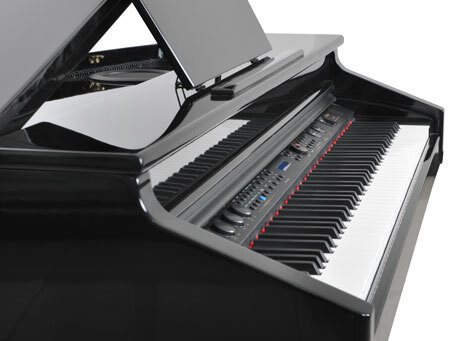 The instrument combines many features into one beautiful, elegant Grand Piano that is fun for the whole family to enjoy. The Artesia AG-28 features a sophisticatedly crafted 2'8" Grand Piano cabinet that comfortably fits any room size or home décor. Its beautiful polished hand rubbed Ebony Gloss Finish gives a deep, rich luster. The fallboard is designed such that the panel controls can be completely hidden - making the instrument appear like an acoustic grand piano! 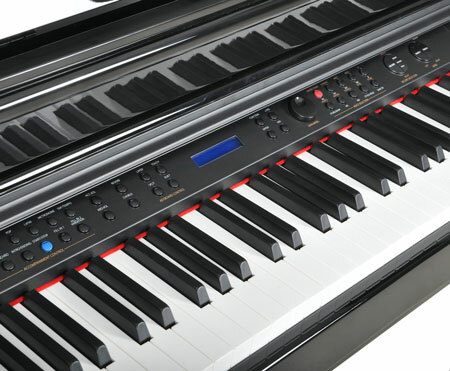 The Artesia AG-28 natural balanced hammer action keyboard brings the feel of an acoustic piano to your finger tips. Its advanced hammer action design offers excellent response and smooth playability that will satisfy even the most demanding teacher or performer. 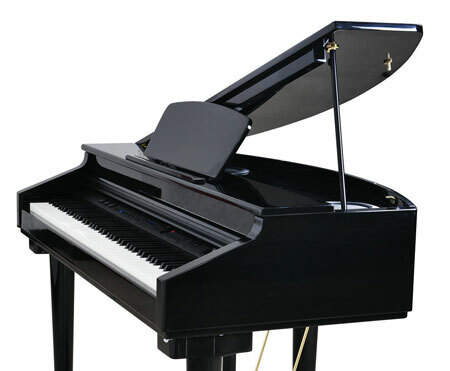 The Piano is divided into two keyboard areas, which allow both teacher and student to play the same piano sound in the same octave. Additionally the pedal function changes so that the left and right pedals are now designated as sustain pedals for both teacher and student to use. The AG-28 offers incredible sound realism with its acoustic sound sample processing. It records the actual acoustic instrument capturing their remarkable depth, expression and essence. Instruments such as Pianos, Guitars, Wood Winds and Brass Instruments, Drums, Percussion, Synthesizers and so many more are included. All instrument voices have incredible dynamic response. The AG-28 has a convenient USB Port and comes with a thumb drive that is loaded with hundreds of pre-recorded songs that you can playback for your listening pleasure. You can play along with these pre-recorded pieces. Practice sessions can be recorded onto the thumb drive for later review. The AG-28 is Bluetooth compatible which allows you to play along with your favorite songs or turn your piano into a home entertainment center for the whole family to enjoy. 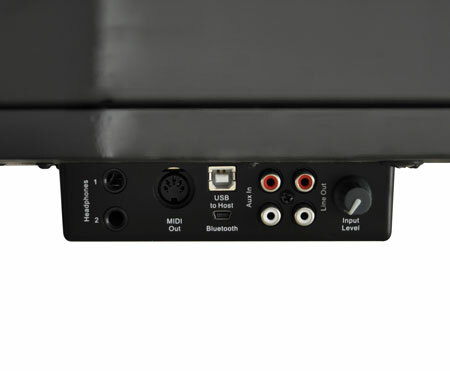 Simply adjust your Bluetooth device (smart phone, tablet or laptop) to play through the pianos dynamic stereo sound delivery system. The AG-28 automatically produces full backing parts. It's like having an expert band playing with you, following your every move and chord change. An easy-to-use internal song recorder will save your playing or sudden inspiration at any moment with just a touch of a button. For more advanced projects, the Multi-tracked Recorder offers a full 16-tracks of recording channels. The AG-28 has Play Along Song features that can enhance your playing skills. It has over 50 play along songs that allows you to practice playing your left and right hand separately first, then using both hands simultaneously as you have learned the musical piece. The familiar standard songs are an excellent way to sharpen your playing skills. Have a Fun Learning Experience Like Never Before. There has never been a better time to learn how to play a musical instrument. 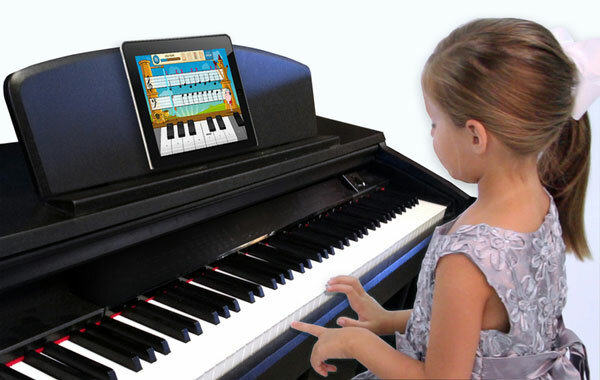 With the advent of laptops and tablets it is easier than ever before to immediately start to learn how to play piano from fun musical game Apps.